A recipe for people who can’t follow directions. Although to be fair, it would probably be hilarious for everyone else. Anyhow, everyone loved it and demanded the recipe so I promised I’d share. Then I was asked if I’d followed the recipe exactly, and of course I did because being exact is very, very important to me of course I didn’t, so I also promised to add notes with my variations. And the notes turned out to be funny, so I’m sharing the whole thing with you too. If it isn’t obvious, my notes are in italics. ½ cup tomato paste* (I picked up little cans of compliments tomato paste. ½ a cup 118ml and my little can was 152ml and there’s totally no way I was save a tiny little bit of this tiny little can so it all went in. I just added more peanut butter to balance it out). Adapted from Cookie and Kate as well as Local Bounty: Vegan Seasonal Recipes by Devra Gartenstein. *The cookbook author suggested that 1 cup canned crushed tomatoes is a suitable substitution for the tomato paste, but commenters report that the crushed tomatoes produce a runny soup (unlike the thick soup shown here). I highly recommend using tomato paste if you can find it. I also recommend Muir Glen‘s organic tomato products—they come in BPA-free cans and seem to be readily available. 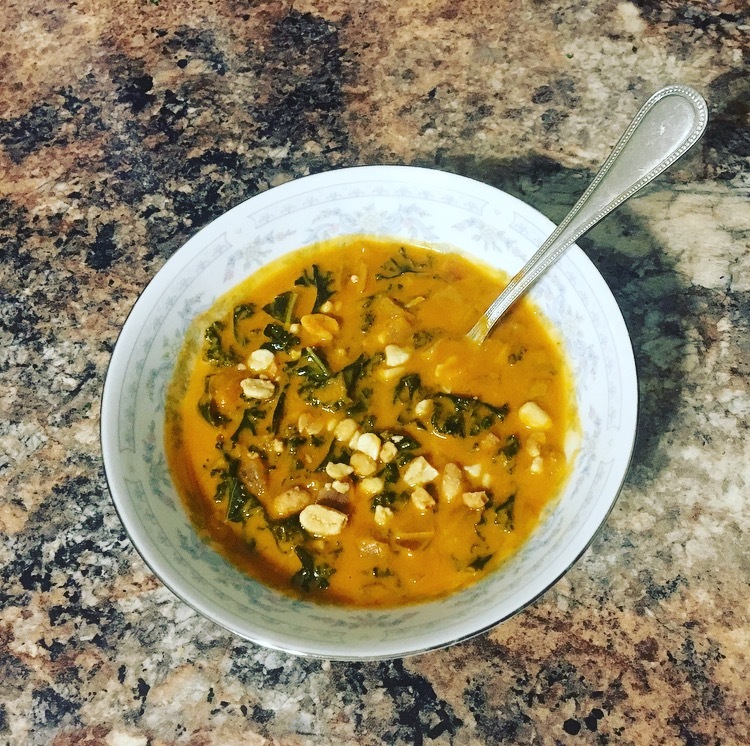 Most African peanut soup recipes include sweet potatoes. I suppose you could toss in a chopped sweet potato when you bring the stock to a boil, but I liked the soup as is. *The last soup I made really did make someone throw up, but they have terrible indigestion but love spicy stuff and the soup was really spicy. I’d like to point out in my defense, that they said it was delicious on the way down. I didn’t ask how it was on the way back up.